The 5 & 10¢ store. 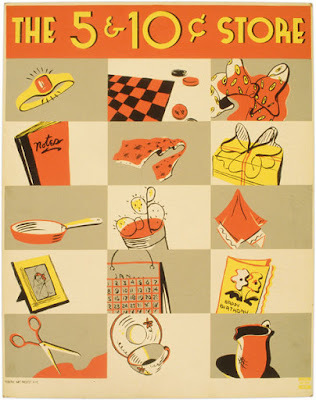 Poster for the Works Progress Administration shows various items that can be purchased at a five and ten cent store: a ring, checkers board, scarf, notebook, tie, gift box, pan, cactus, handkerchief, photoframe, calendar, birthday card, scissors, tea set, and pitcher. Silkscreen print by the NYC Federal Art Project, between 1936 and 1941. (By …trialsanderrors (The nickel and dime store, WPA poster, ca. 1941) [CC-BY-2.0 (www.creativecommons.org/licenses/by/2.0)], via Wikimedia Commons). I celebrated a birthday this month and surprisingly did not think about treating myself to tea on the day. Here's hoping to next year so I can celebrate it with tea. How have you incorporated tea into your birthday or other special occasion?